As a consequence of problems in auxiliary plant areas as well as disrupted hot-metal logistics caused by a torpedo car derailment, process irregularities escalated at Tata Steel Kalinganagar blast furnace #1 and put the hearth into a “chilled” condition, immediately stopping production. The Kalinganagar works relies on a single blast furnace for the full supply of hot metal to downstream operations, and immediate action was required. 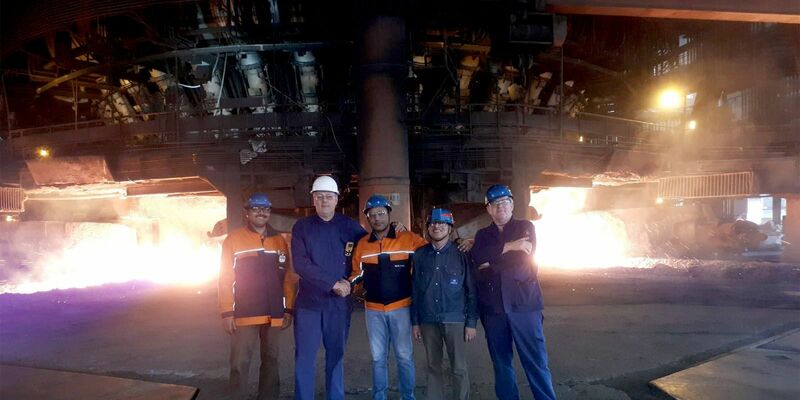 A team consisting of Danieli Corus experts and senior operational staff from the Tata Steel site in IJmuiden travelled to India to implement the best-in-market recovery practices. It is based on applying oxy–fuel lance technology in combination with highly-specialized operational expertise. After 16 hours of drilling, lances could be inserted and ignited in order to restore the connection between the tapholes and tuyere level that is required for restarting production. After 95 hours, sufficient heat had been introduced into the furnace hearth to allow for reconnection to the hot blast system, marking the restart of the reduction process. On the fourth day, the first cast was made and nine days into the recovery project 60% of the tuyeres had been reopened. Within two weeks after the first cast, hot metal quality was within specification for processing at the BOF plant. This recovery project is the 37th completed by Danieli Corus, confirming the undisputed leadership in blast furnace operational services. Danieli Corus offers a comprehensive portfolio of services for blast furnace operations.